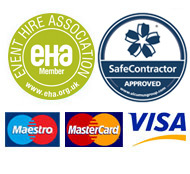 We, at Athena Catering Hire Ltd, have always taken the protection of your personal information and data very seriously and we will only use your information to administer your account and provide the equipment and services you have requested from us. We gather this data from you, our customers through incoming enquiries, and ongoing contracts. This data is processed on to our system safely stored on our back up devices, and printed documentation securely held at our office address. Your information will only be used for the legitimate business purposes. We will not transmit your information to other parities unless it is required to fulfil agreed services. All data disclosures will only be relevant to the particular requirements of the requested service and will be handled in accordance with the guidelines of GDPR. Please inform us promptly should you have any concern in relation to the above or if you no longer wish us to retain your data then please email sales@athenacateringhire.co.uk. We may be required to retain certain data for a certain period of time to comply with other legislation.